Friends of ours had a baby a couple of weeks ago, this is the card that I made for her. ﻿I've used some items that are now available in the new SU! catalogue. 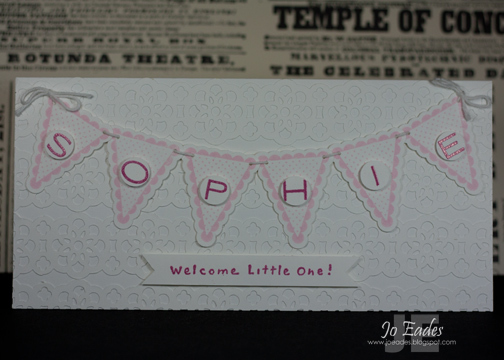 I've stamped the pennants using Pretty In Pink ink and punched them out with the Petite Pennants punch. The letters and sentiment were stamped in Versamark and embossed with Melon Mambo embossing powder. These were punched out using the 1/2" RD punch. For the background, I added some of the Bigshot Adhesive sheets to the back of Whisper White cardstock and then punched them using the Lace Ribbon punch. I'm still not sure if I'd recommend this method to others as my punch didn't really seem to appreciate that very thin extra layer of glue and backing paper but it did make it a cinch to adhere to the card. This card is a bit bigger than normal, from memory I think it was 21 x 20 cm with the 20 cm side being folded at 10 cm. I can tell you that it fits into a DL sized envelope though. And as extra long as this card is, I still couldn't fit the name William on, so Flickity Flick, young William will have to wait a bit longer for his welcome to the world card whilst I try to come up with another idea! The white lace on white looks really effective - such a pretty card. This is so sweet Jo. Loving the pretty punched bits, and white on white....just lovely.